Don't sleep on this Bellator card! Bellator 171 comes after the highly touted event with Ortiz versus Sonnen. The card also is the one before Fedor versus Mitrione. Bellator 171 has some interesting fights with prospects fighting to see if they belong or not. 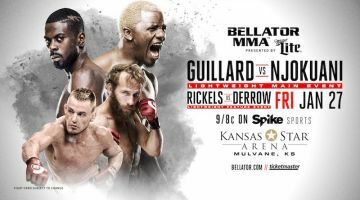 The main event will see undersized veteran Melvin Guillard versus knockout artist Chidi Njokuani. Melvin Guillard is a true veteran of the fight game with a total of 48 professional fights. Chidi Njokuani knocks people out for fun. This fight should be interesting to see but Guillard at 33 may be on the downside of his career. Guillard has lost 3 of his last 4 fights with the other fight being a no contest. He has lost 8 of his last 13 with two of those being a no contest. With only 3 wins in his last 13 fights it is time for Guillard to prove that he isn't on the down swing of his career. On the other hand, Njokuani has only 1 loss and 1 no contest in his last 10 fights. Njokuani is currently on a 6 fight win streak with the last two being knockouts. The co-main event of the evening features Dave "The Caveman" Rickels versus Aaron Derrow. Dave Rickels has one of the best entrances in MMA and one of the more entertaining fighters. Rickels has a complete game can win by decision, KO, or submission. He has lost 3 of his last 10 contests with 2 no contests. He is entertaining but can it lead to wins instead of just show. Derrow is a submission artist but with 6 losses in is last 10 fight can he use is submission ability to pick up a win. Overall the prelims and the main card should be an entertaining night of fights.